Skelly Selest is the latest game from Caiysware, the developer behind the chunky low-rez roguelike dungeon crawler Straimium Immortaly. 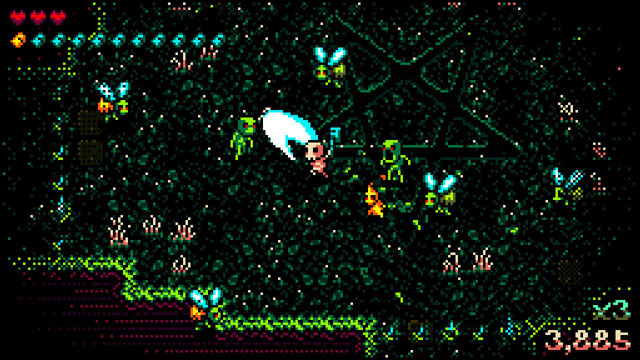 Skelly Selest also features roguelike dungeon crawling through chunky low-rez environments, but offers numerous other game modes as well, including several arena combat modes, super tough one-off challenges for expert players, and even a card game inspired by Final Fantasy VIII’s Triple Triad. In most of these modes, players dive into the action equipped with an axe and a gun, but the gun only has five bullets. By killing enemies with the axe, bullets are restocked, keeping players on their toes as they deal with different enemy types. The game features loads of stackable powerups that significantly alter how players take on each run, as well as several unlockable characters, each with their own strengths and weaknesses.